Strawberry Peach Rosé Sangria - Full of fresh strawberries and peaches, strawberry liqueur, peach nectar, vodka and Rosé wine. All of our faves in one glass! If desired, remove peach skins and pits (see *note), and cut into 1/4 inch slices. Rinse strawberries and dry them. Reserve enough whole strawberries to garnish each glass. Hull the rest of the strawberries and slice. Slice one lemon into 1/4-inch thick wheels and set aside. Combine Rosé, strawberry liquor, peach nectar, vodka, and juice from one lemon juice in a glass pitcher. Shortly before serving, add the sliced strawberries, the sliced peaches, and the lemon wheels to the pitcher. Fill glasses with ice and add 5 ounces of Sangria plus some of the fruit from the pitcher. Garnish each glass with one of the whole strawberries you reserved. Sometimes fresh peaches aren't completely ripe when purchased. So plan to purchase them a few days before you actually need to use them, and leave them sitting out to ripen. - Use a sharp paring knife to make an "X" at the base of each peach. - Drop them into boiling water for about 30 seconds. - Quickly remove them and drop into ice water for 1-2 minutes. - Once cool enough to handle, slip off the skins. Many recipes recommend adding the sliced fruit to the pitcher and chilling overnight so that the fruit is infused with the flavors. 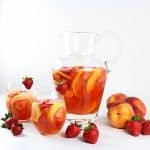 However I find that the strawberries and peaches can lose too much of their texture, and also change the consistency of the Sangria. For this Sangria I prefer adding the fruit within an hour before serving.